Namasur, a Redguard destruction mage, is a vampire living in Volkihar Keep. He will introduce himself, saying, "I'm a loyal servant of the lord of the castle, nothing more." He may comment on the feasts, saying, "The feast never ends here in Castle Volkihar", "Sit down and enjoy yourself", or "There's plenty for all." Namasur wears a set of gray colored vampire armor with a matching pair of boots. He is equipped with a leveled one-handed weapon which can be up to elven quality. He carries random leveled bandit loot, as well as a 25% chance of carrying 1-9 gold. 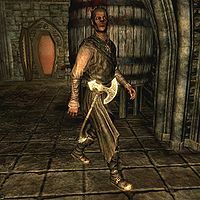 If the player sided with the Dawnguard, he will be one of the Vampires outside the front gate during the quest Kindred Judgment. This page was last modified on 3 September 2018, at 23:55.